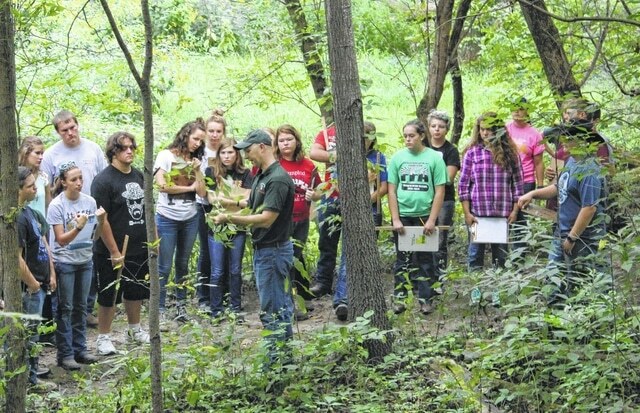 BUCYRUS — High school students gathered Sept. 8 at Camp Michael for the Crawford Soil and Water Conservation District’s Forestry Contest. Eight schools competed: Colonel Crawford, Wynford, Buckeye Central, Bellevue, Plymouth, South Central, Western Reserve and Black River. The day began with educational sessions on general forestry and tree identification led by Steve McGinnis, ODNR Division of Forestry, and timber cruising led by Tyler Pope, Buckeye Central Vocational Ag teacher. Each student was individually tested in their knowledge of timber cruising, tree identification, general forestry, chain saw parts and troubleshooting. The top school honors went to Wynford High school, which had the highest average score. Second place was awarded to Plymouth and third was Buckeye Central. The top five individuals were: First place, Annika Gerlach – Wynford; second place, Luke Scott – Wynford; third place, Douglas Reer – Plymouth; fourth place, Emily Kanney – Plymouth; Fifth place, Steven Lepard – Colonel Crawford.